Rates of the MRSA superbug have been slashed through an intensive hospital cleanliness programme. University College London Hospital says it has cut MRSA rates by introducing universal cleanliness standards. Experts say superbug rates could be cut dramatically if the technique was introduced across the NHS. It has been estimated the MRSA (methicillin-resistant Staphylococcus aureus) is killing up to 5,000 people a year in England. 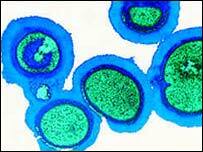 MRSA bugs have built up resistance to antibiotics commonly used in hospitals. Many hospital-acquired infections are caused by staff using non-sterile techniques for procedures including intravenous injections, say infection-control staff at UCLH. But nurses at the hospital have devised a way to create an aseptic (infection-free) environment which reduces the amount of disease-causing micro organisms to a minimum which has cut the number of infections among its most vulnerable patients. The haematology unit at University College Hospital in London has developed the Aseptic Non Touch Technique (ANTT), which involves a programme of hand-washing and sterilising techniques to protect patients from contamination. Picture guidelines showing how to carry out the technique are displayed in all clinical areas. It is being introduced across the trust, with more than 2,000 nurses being trained to use it. Stephen Rowley, a senior nurse in haematology, who developed the technique, said: "Improved standards of cleaning and hygiene are important in controlling infections like MRSA. "However, our research shows that one of the most effective ways of containing acquired infection is through the application of a standardised aseptic technique for clinical procedures. "I believe if this technique was adopted across the NHS there would be a dramatic reduction in patients infections and deaths from MRSA and other acquired infections. Geoff Scott, a medical microbiologist at UCLH said: "ANTT works. Due to its patient types the haematology unit should statistically have the highest rates of MRSA cross infection in the hospital. It has the lowest. "ANTT has changed aseptic practice form being adhoc and highly variable to being completely standardised. For example it has improved hand washing effectiveness and ensures that hand washing is done at the right times." "ANTT has changed aseptic practice from being adhoc and highly variable to being completely standardised. "It has improved hand washing effectiveness and ensures that hand washing is done at the right times."